On 17th March 1959, Tenzin Gyatso, the current Dalai Lama fled Tibet following the Chinese invasion and took refuge in Dharamshala, Himachal Pradesh, where he established the Tibetan government in exile. McLeod Ganj or ‘Upper Dharamshala’ located 10km above Dharamshala became the official residence of the Dalai Lama and the haven of thousands of Tibetans. 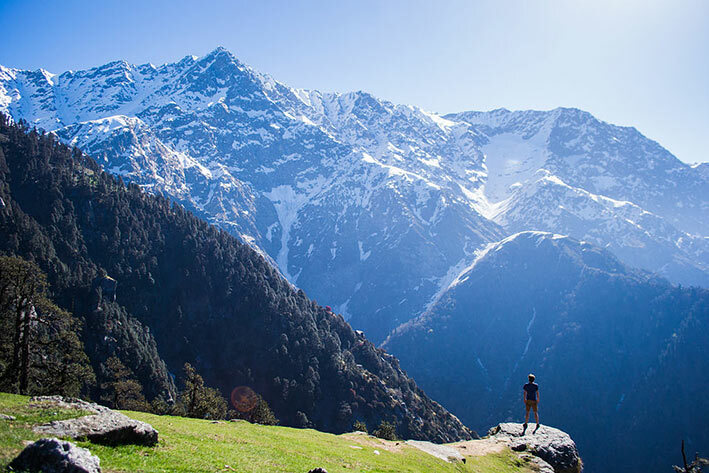 Over the years, McLeod Ganj turned into one of the most attractive mountain resorts in India not only for its Buddhist culture but also for its relaxed ambience and the beauty of its mountainous landscapes. 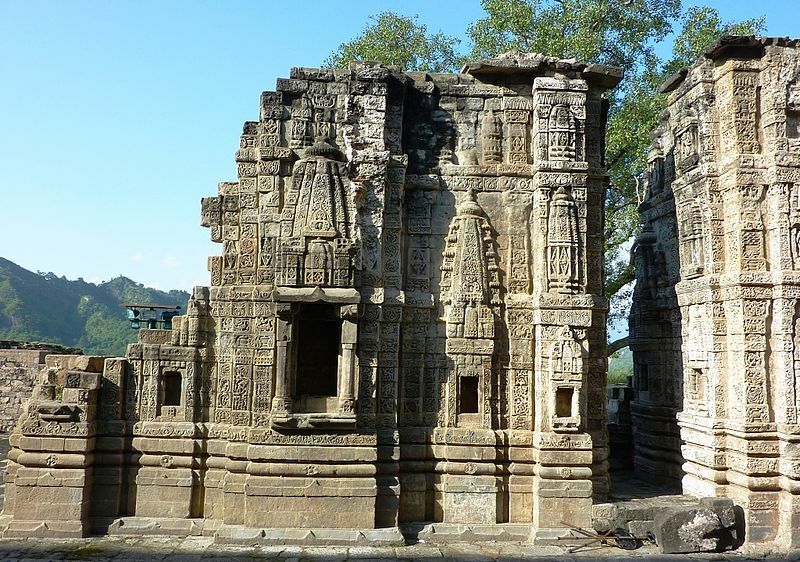 Long before becoming a refuge for Tibetan people and up to the British Empire, the region (Kangra) was ruled by the Rajput Katochs sovereigns, one of the oldest royal dynasties in the world. With the arrival of the British Raj emerging victorious from the second Anglo-Sikh War (1848-1849), the royal family of Katoch is reduced to a fief; Mcleod Ganj becomes the British summer capital, and the Kangra region one of the Punjab provinces run by the governors of Lahore. After the massive earthquake of 1905, which killed thousands of people and almost destroyed Dharamshala, the British summer capital was moved to Shimla. 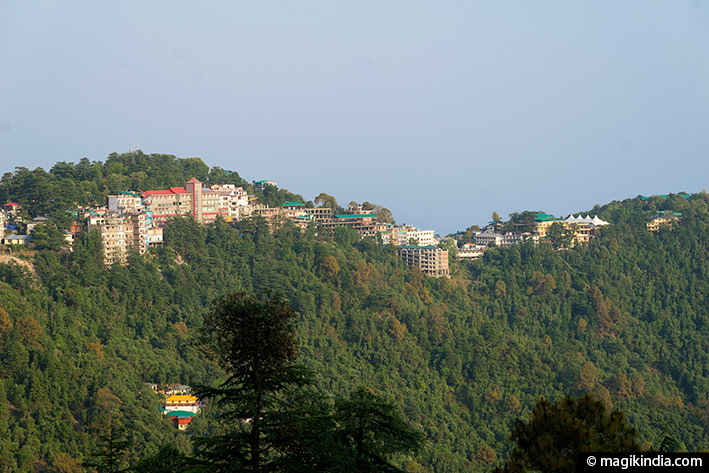 McLeod Ganj derives its name from the lieutenant-governor of Punjab, Sir Donald Friell McLeod. The city perched on a ridge at an altitude of 2082 meters is also sometimes known as “small Lhasa”, after the Tibetan capital. Mcleod Ganj has roughly two main streets lined with hotels, handicraft shops, souvenir stalls and restaurants offering various cuisines. 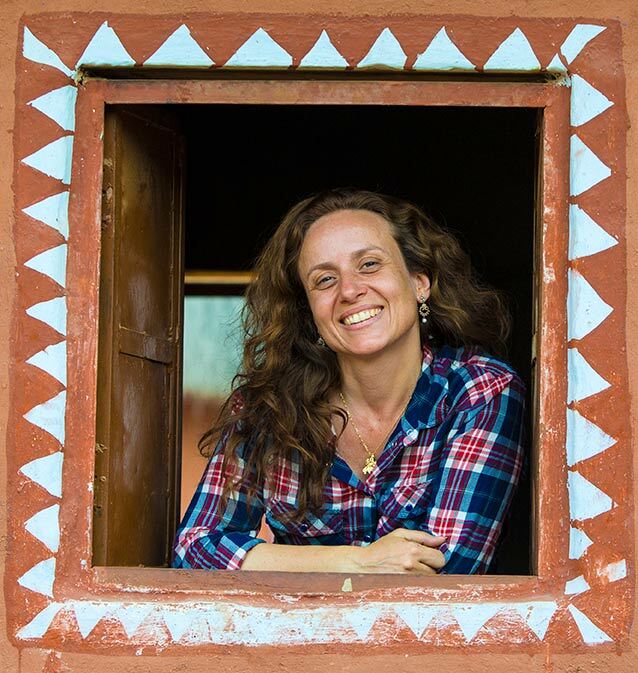 During the peak season (from May to November), McLeod is a crowded and very (too) touristy city, but the Indian youth and hippie foreigners are particularly fond of it. 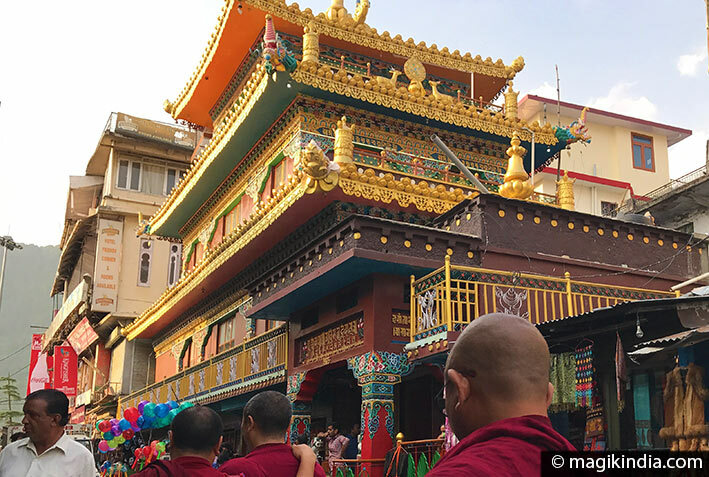 To find a bit of tranquility, start your day early in the morning and follow the Buddhist pilgrims on the Temple Road who walk to the Dalai Lama’s residence while chanting their rosaries. McLeod Ganj has no ancient monuments, the main attraction there is the residence of the Dalai Lama called ‘Tsug La Khang’, that consists of a monastery (Namgyal Monastery), several temples and a museum. 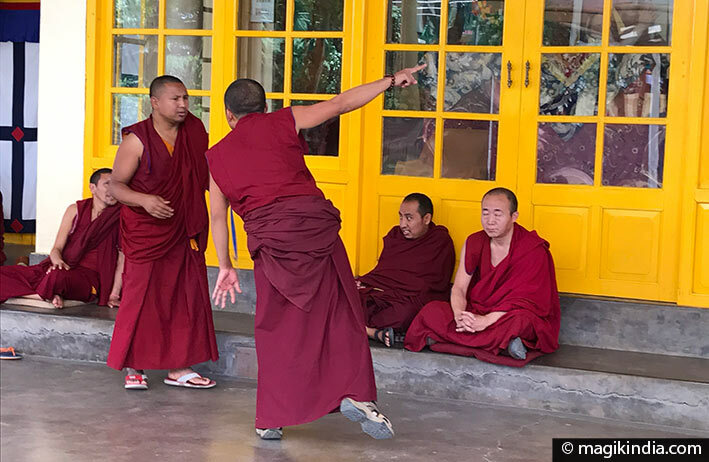 While entering the complex, echoes of voices arouse our curiosity: it is the famous verbal jousting of the tibetan monks debating about Buddhist philosophy ; it is punctuated by hand-claps marking the rhythm of the discussion and the determination of the debaters. Even if we can’t understand the argumentation, these debates are always very interesting to observe. The main temple, where the Dalai Lama gives speeches several times in the year, contains a statue of Sakyamuni Buddha above his seat as well as the effigy of Chenresig. The Tibet Museum is located below the temple. 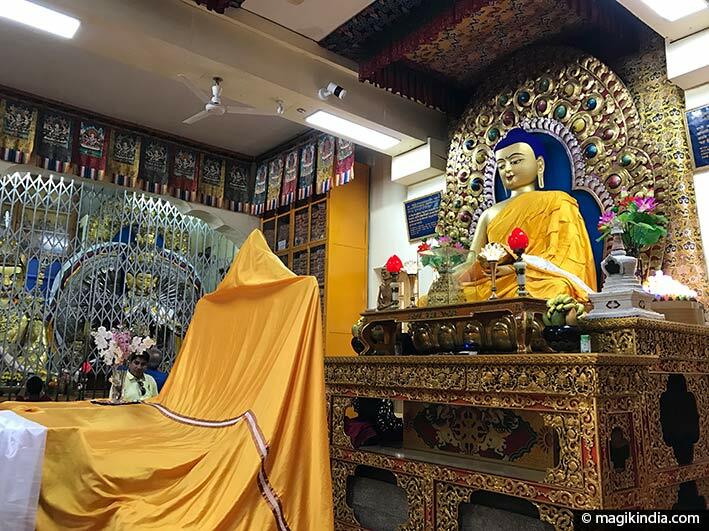 Inaugurated on April 30, 2000 by the Dalai Lama, the Tibetan Museum aims to preserve the Tibetan identity and to make known and to spread Tibetan culture. It includes a collection of more than 30,000 photographies on the past and contemporary history of Tibet. 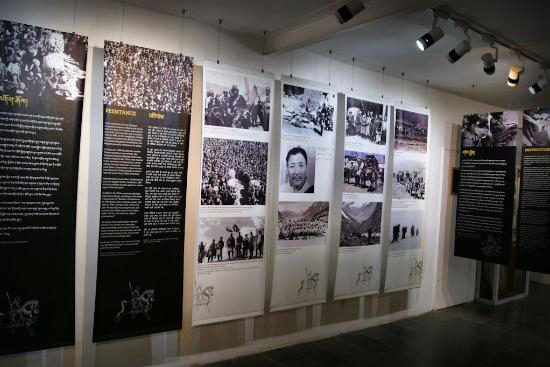 A permanent exhibition serves as a memorial for the Tibetans who died for the freedom of their country and shows also the current situation of Tibetans people under the Chinese occupation. While in MacLeod Ganj, why not tasting Tibetan cuisine? Avoid at all costs the insipid momos sold in the streets and, instead, go to the restaurant ‘Tibet Kitchen’ on Jogiwara Road ; There are always several Tibetan monks sitting at the tables, that’s a good sign. Tingmo (steamed bread), thenthuk noodle soup, curry momos, chexo yogurt rice and chhurpi cheese will delight your taste buds. 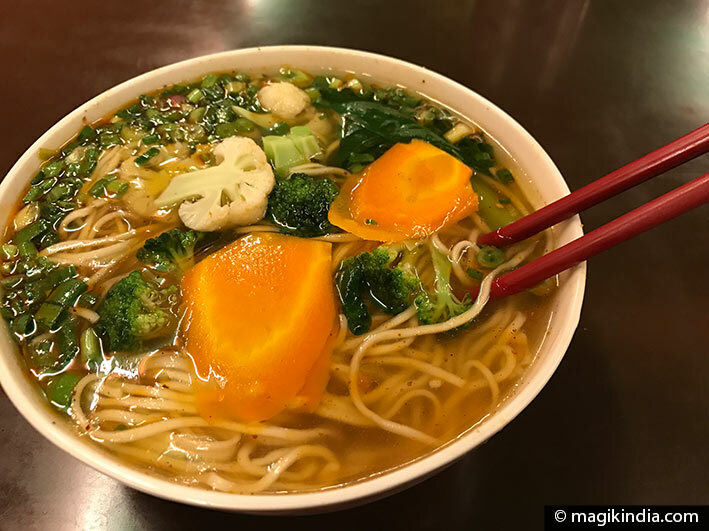 The ‘Nick’s Italian Kitchen’ in Bhagsunag Road also serves good Tibetan dishes, but especially a whole range of Italian pastas, fresh fruit juices and delightful pastries with or without eggs for people on a vegetarian diet. 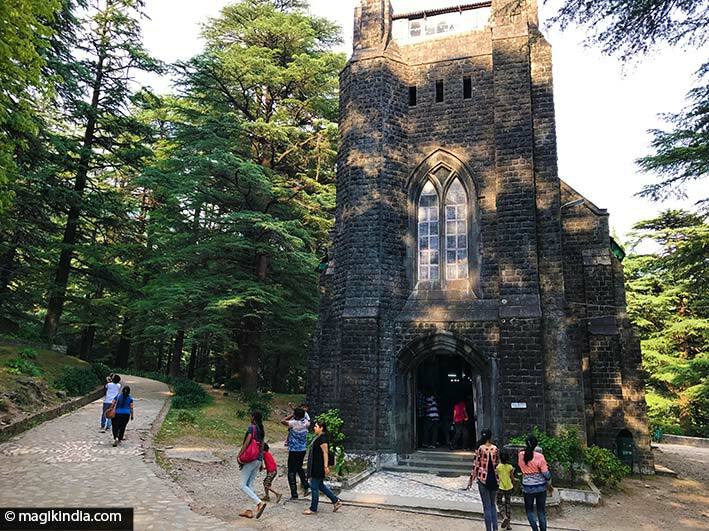 Going down towards Dharamsala, between Mcleod Ganj and Forsyth Ganj, you come across the Anglican Church of ‘St. John in the Wilderness’ dedicated to John the Baptist. Built in 1852, in the midst of cedar forest, it displays Neo-Gothic architecture and lovely Belgian stained-glass windows, which were offered by Mary Louisa Lambton, Countess of Elgin and Kincardine (U.K). 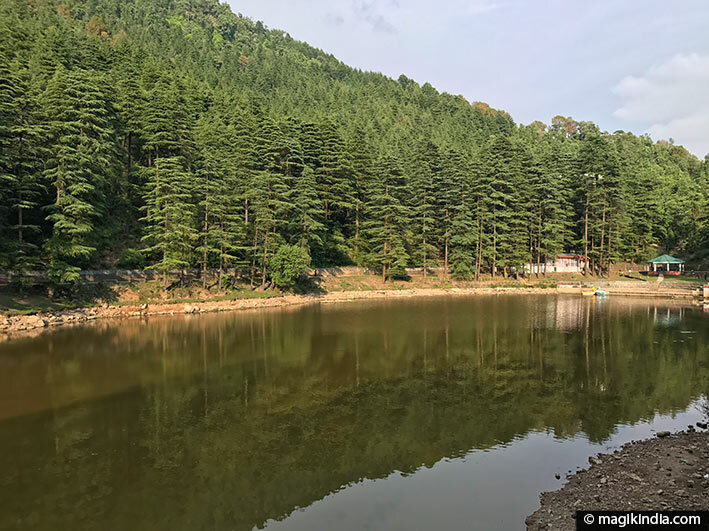 The village of Naddi, about 3 km from McLeod Ganj, offers a beautiful panorama on the Dhauladhar mountain range and it is the starting point for many trekkings (Dharamkot, Triund, Kareri Lake …). Surrounded by a thick cedar forest, Dal Lake is considered a sacred place as a small Shiva temple is set on its banks. The lake is at the peak of its affluence in September of each year when a fair in honor of Lord Shiva is held to which the Gaddi tribe attend to. 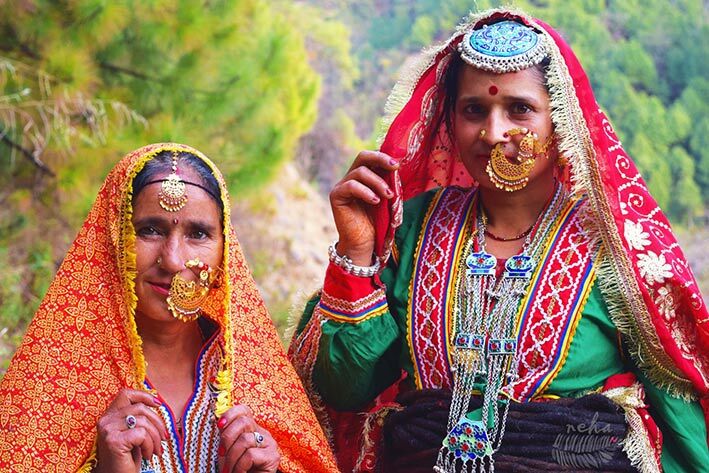 The Gaddis is one of the many tribes of Himachal along with the Kinnauris, Lahaulis, Spitis and Gujjaris. They reside mainly in the region of Kangra, Mandi, Bilaspur and Chamba. It would seem that these people were driven out of the Indian plains during the Mughal invasions and took refuge in the mountainous parts. Originally, the Gaddis were nomad shepherds; They have now added strings to their bow: agriculture, weaving and making iron utensils. Gaddi women are recognizable to their very colorful traditional clothing, often red and green. A light shawl covers their heads and heavy necklace and tikka (head jewelry) in silver and an enormous golden nose ring complete the outfit. The Gaddis are predominantly Hindus and related to the cult of Shiva but some of them are of Muslim faith. 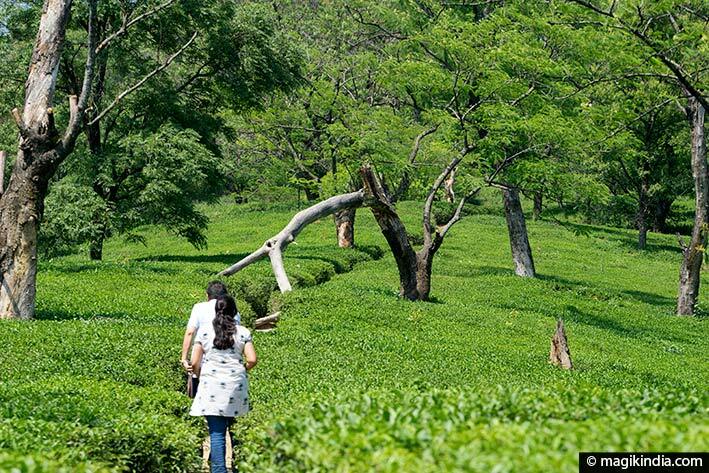 The main tea plantations of Himachal Pradesh are located in Palampur, 20 km from the Baijnath Temple (see below) but you will also find them just below McLeod Ganj; A nice little stop on your tour around MacLeod. 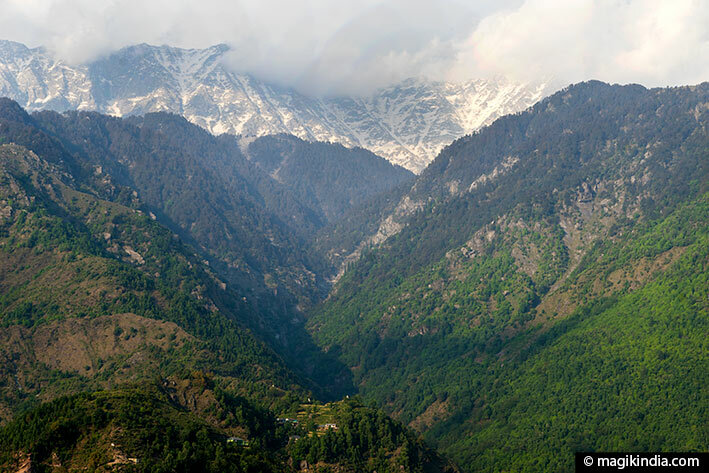 Dharamkot is a small village 2km above McLeod Ganj, where many foreigners (mostly Israelis) have taken up residence. There are two Buddhist meditation centers: Vipassana and Tushita and the Tibetan Institute of Performing Arts, which was created to preserve the Tibetan artistic heritage, especially opera, dance and music. 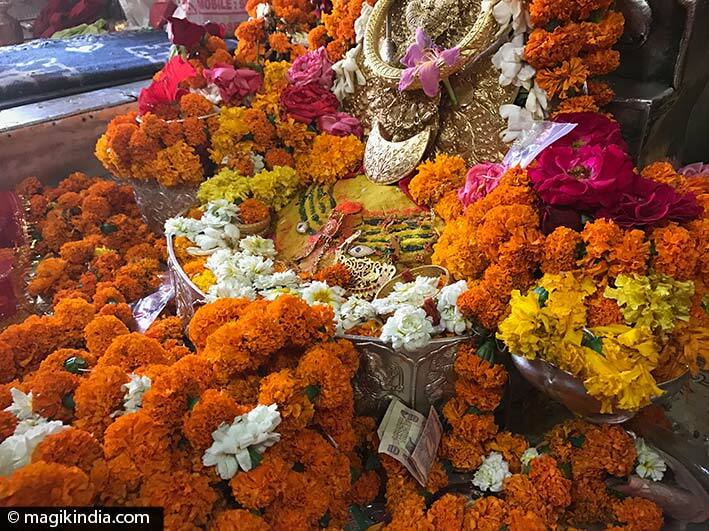 A 6km forest track starts from Dharamkot to the small temple of Gallu dedicated to Shiva. From here a 3 to 6 hour trek leads you to Triund Hill (see below). Dharamshala is located 10 km down from McLeod Ganj. The city was recently declared the winter capital of Himachal Pradesh; Thus this state has two capitals, Shimla and Dharamshala. Dharamshala, unlike McLeod, is not very touristy and the main attraction here is the Library of Tibetan Works and Archives. 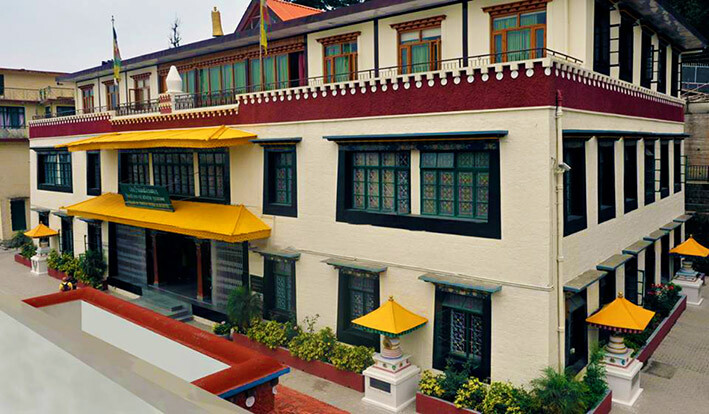 The Library of Tibetan Works and Archives inaugurated in 1970 by the Dalai Lama is not only a library and a museum, it is also a full-fledged academic institute where cultural and educational courses and seminars are regularly organized. 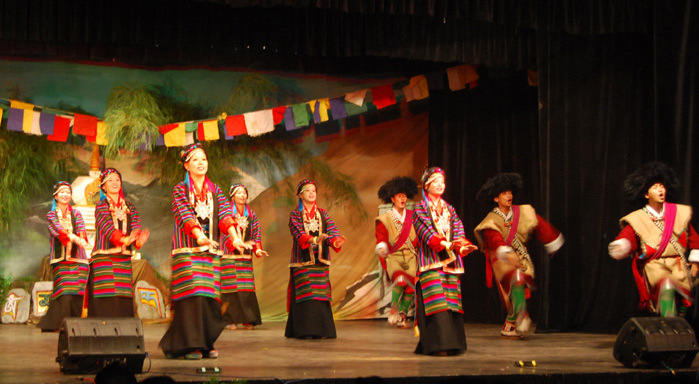 The purpose of the institution is to preserve, promote and disseminate Tibetan culture, acquire and preserve Tibetan books and manuscripts, and provide reference materials for studies on Tibetan culture. It has also Tibetan artefacts, Thangkas (traditional paintings) and various photographies. Located at an altitude of 2800 m, Triund hill is one of the main touristic places for its beautiful panorama on the Dhauladhar range. Triund means ‘three mountains’, those that can be seen from this point. Access to Triund is either by road or by an easy/moderate trek (3 to 6 hours) from Gulla temple (see above). During the trek to Triund, your road cross the 20m high Bhagsunag waterfalls (to visit preferably after the monsoon in July-August). Bhagsunag is a small village, 11 km from Dharamsala, known for its ancient Shiva temple.The waterfalls are 1 km from the temple. 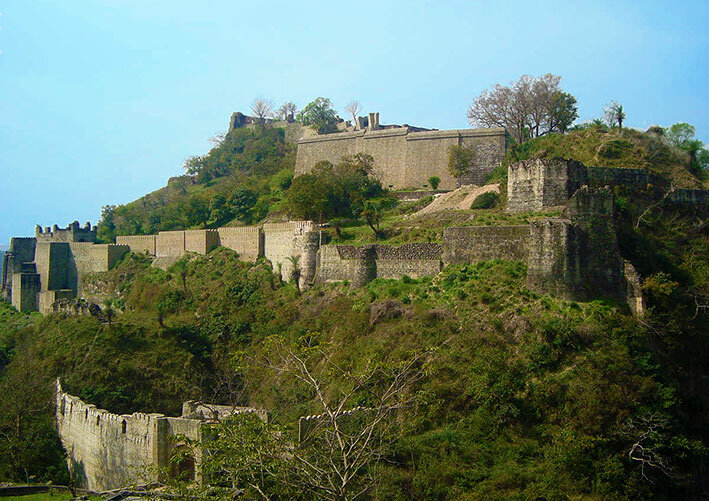 Perched on a rocky hill at the confluence of the Banganga and Patal Ganga Rivers and 20 km from Dharamsala, Kangra Fort is one of the oldest fortresses in India; Its origins date back to the 4th century AD. The fort covers an area of 190 hectares and its walls stretch over 4 km. It was the seat of the Katoch rulers. You must reach the summit to admire the Hindu temples of Lakshmi Narayana, and Ambika Devi and a jain temple, which said to host the original idol of Mahavira, the 24th and the last of the Tirthankaras (Jain saints). 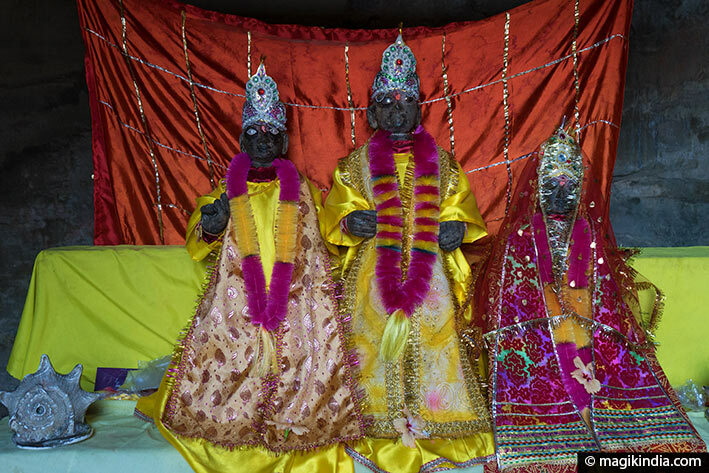 The temple of the goddess Bajreshvari, located in the town of Nagarkot, close by the Kangra fort, is a high place of pilgrimage for Hindus: It is one of the 51 Shakti Peetha, it is said that the left breast of Sati, Shiva’s consort, fell here. The date of the original construction of the temple is not known but it seems that the sanctuary was already very popular in the 11th century. 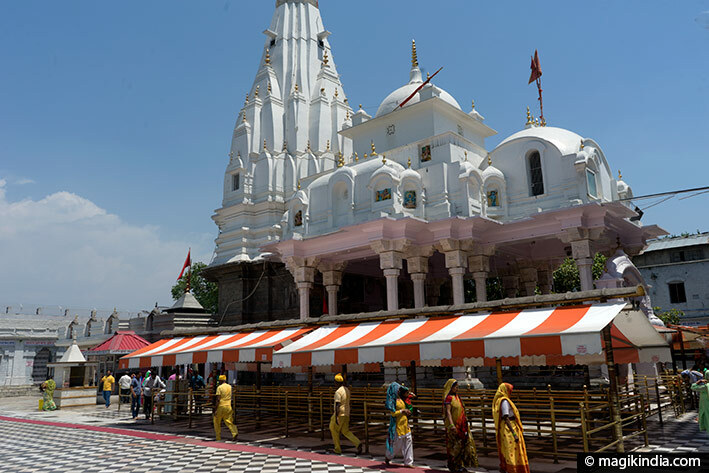 The temple was completely destroyed during the earthquake of 1905 and rebuilt around 1930. It presents an architecture of three different religions: Hindu, Sikh and Muslim. 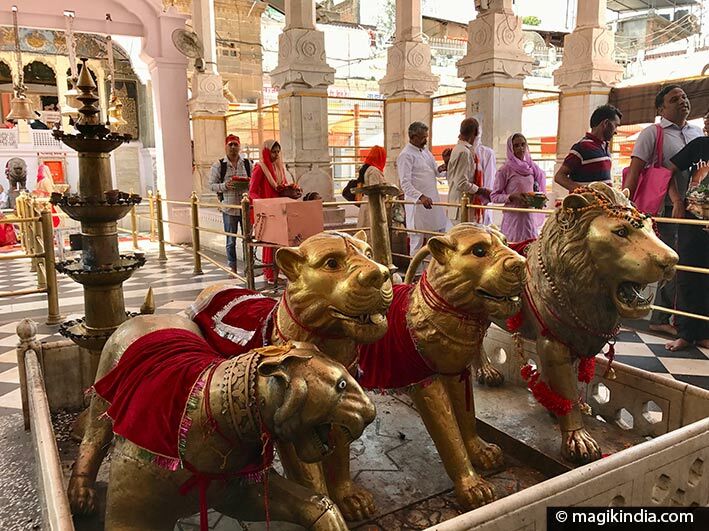 In the main sanctuary, guarded by four imposing lions made of brass, the goddess lies in the form of a ‘pindi’ and not as an anthropomorphic statue; ‘Pindis’ are decorated rocks or tree stumps considered in Hinduism as abstract manifestations of the Divine Mother or Shakti. A legend has that that the goddess used ghee (clarified butter) to heal her wounds made during her battle against the demon Mahishasura. Since then, every year, at Makar Sankranti (January 14), ghee is poured on the pindi. 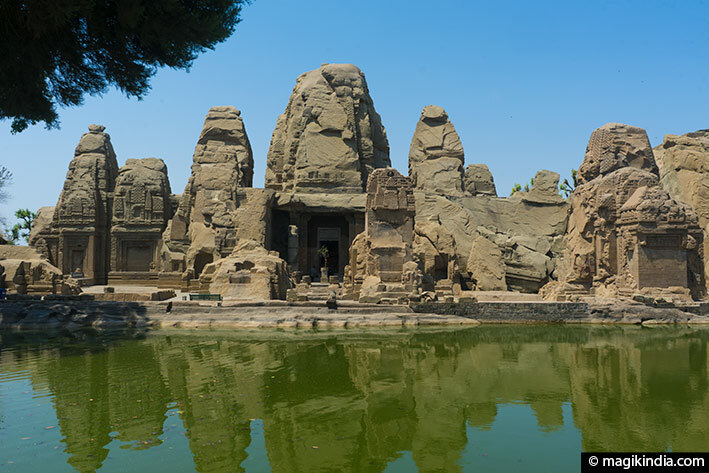 The Masroor Rock Cut Temple is a superb set of Hindu temples located in Masroor, 40 km from the city of Kangra. 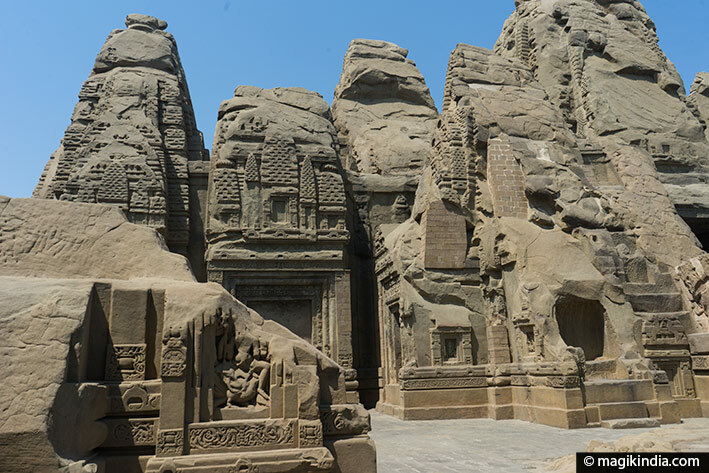 The temples dating from the 8th century are carved in a single monolithic and surmounted by ‘shikharas’ (pyramidal towers); This style of architecture, of the Gupta type in its treatment, illustrates the beginnings of the rock-cut structures as seen in Mahaballipuram, Ajanta and Ellora. The construction of the complex is attributed to the ancient kingdom of Jalandhar or to one of the Katoch rulers. Temples were severely damaged during the 1905 earthquake, but there are still some interesting sculptures and patterns. 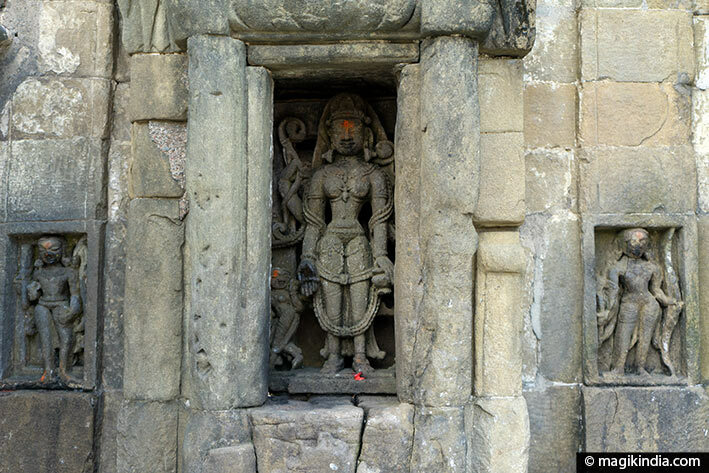 The complex that was originally dedicated to Shiva is now known as ‘Thakurdwara’ or ‘Vishnu’s home’. The sanctuary in the center houses indeed the effigies of Rama (avatar of Vishnu), his wife Sita and his brother Lakshmana. The pond located just in front of the temples is a perfect mirror reflecting the beauty of the place. A must see ! 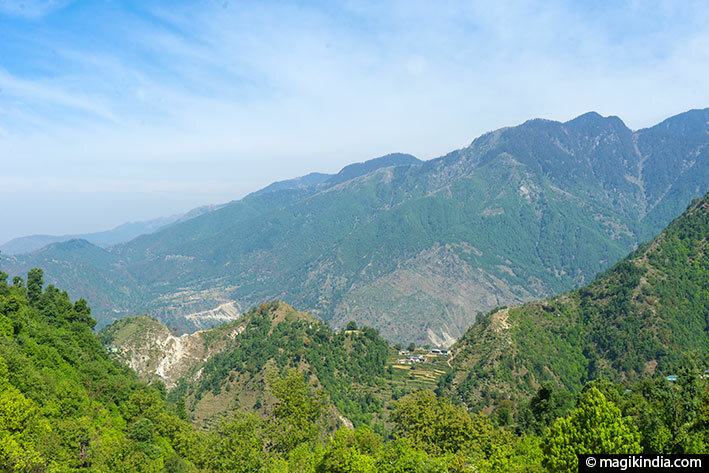 Tatwani is located at a distance of about 35 km from Dharamshala. 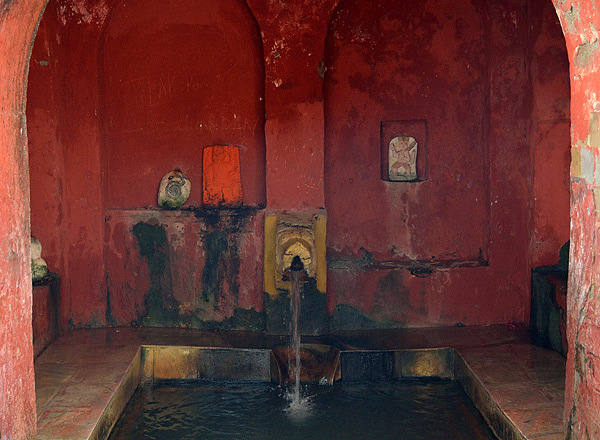 The hot springs emerge from a small temple dedicated to shiva and flow into several basins. The Sulfuric waters are said to have healing properties. For a complete care, it is usual to dive into the fresh waters of the nearby river. 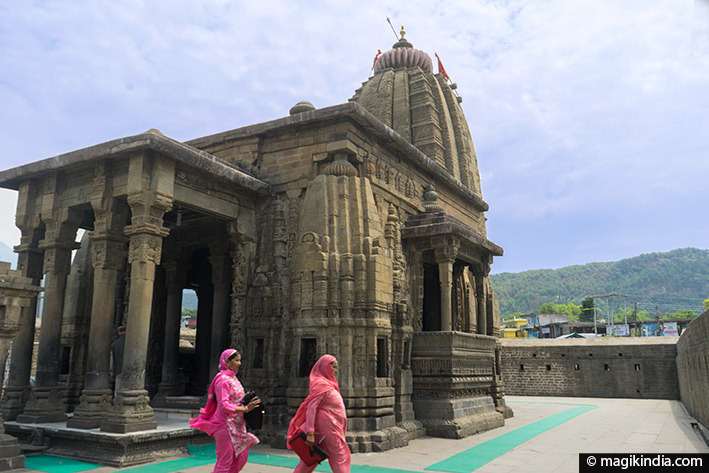 The temple of Baijnath or Vaidyanath located in the city of the same name is about 50km from Dharamshala. The temple dating from the early 13th century is surrounded by a high wall with entrances to the south and north and it is dedicated to Shiva in the form of a lingam. 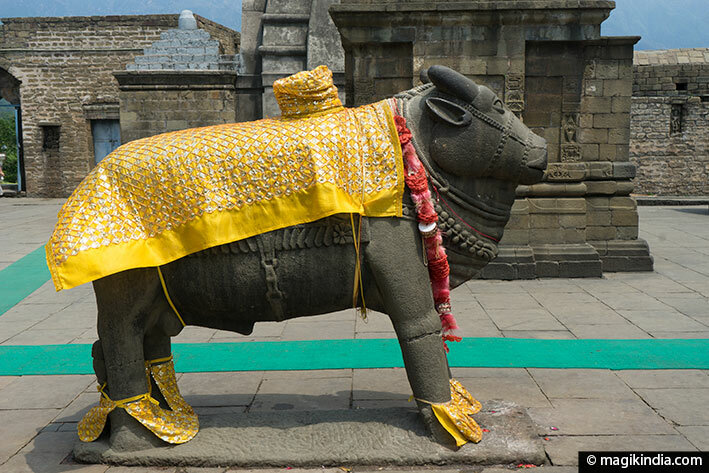 It has a beautiful Nagara style architecture with finely carved facades and a lovely standing nandi (divine bull) at the entrance. Several sources mention this temple as one of the 12 Jyotir lingams or lingams of light. Actually, there are some issues to localize the temple of Vaidyanath mentioned in the sacred texts. 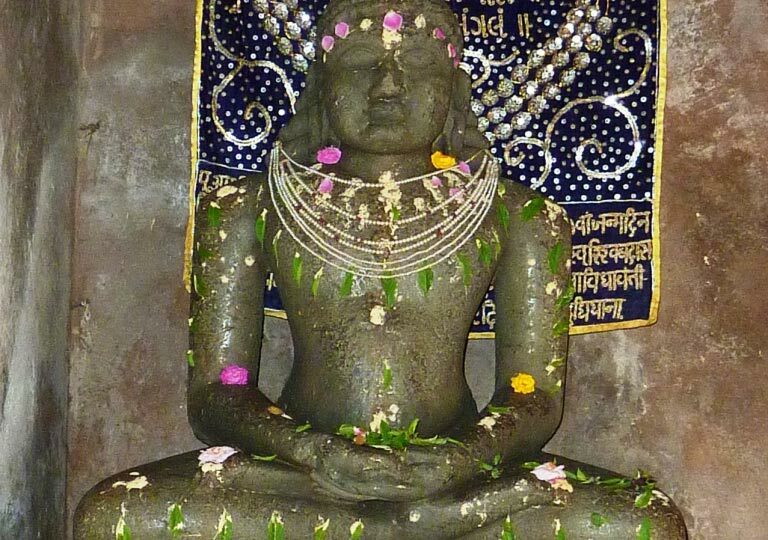 Thus, three temples claim to have the authentic Jyotir lingam of Vaidyanath: the temple of Baidyanath in the Jharkhand, the temple of Vaidyanath in Parli (Maharashtra) and this very one. It seems, however, that Jarkhand one is the ‘real’ jyotir lingam of Vaidyanath.